Above: The Old Fort was begun by the Byzantines although much of the fortifications visible today were constructed by the Venetians. The building that looks like a Greek temple is actually a church (St. George's Chapel) and was built by the British. It is where Prince Phillip was baptized. Below: The New Fort. Built by the Venetians in the 16th Century, this impressive structure still bears the emblem of the Venetian Republic - - the winged lion of St. Mark. 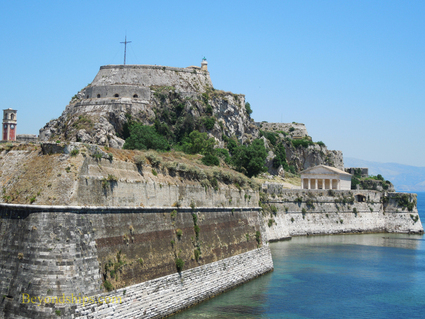 The combination of the two fortresses helped to prevent the Turks from conquering Corfu in 1716. Above: Between the two fortresses is the old town with its narrow streets, shops and sidewalk cafes. 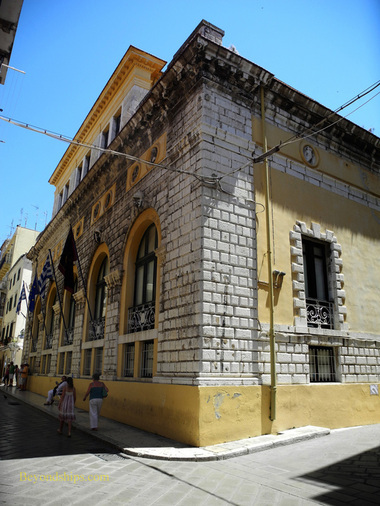 Below: Corfu's town hall was started in 1663 and was once a theater. Above: The view from the southern end of the Kanoni peninsular is one of the most photographed in Corfu. From the heights, you can see two small islets: one is dominated by a monastery and the other, known as Mouse Island, has a Byzantine chapel surrounded by tall cypress trees. 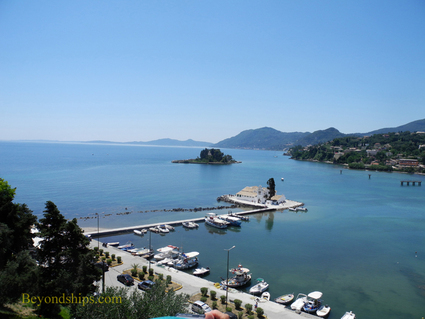 Corfu has long been a travel destination. Indeed, according to legend, Jason and the Argonauts visited here on their search for the Golden Fleece. Romans, Byzantines, and Venetians have all come and left their mark. In the 19th Century, it became the destination of choice for royals, nobles and aristocrats from throughout Europe. More recently, it has become a favorite of holidaymakers - - almost a million a year. Located between Italy and Greece at the entrance of the Adriatic Sea, Corfu long attracted visitors seeking trade or, less welcome, seeking a strategic advantage. Today, the island's mild climate, scenic mountains and picturesque beaches draw the visitors. 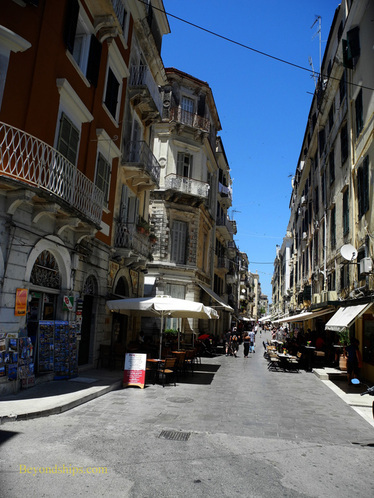 Corfu is considerably more developed than the other Ionian islands. This is especially evident in the environs around Corfu Town, where in some areas there has been commercial development with seemingly little regard for aesthetics. 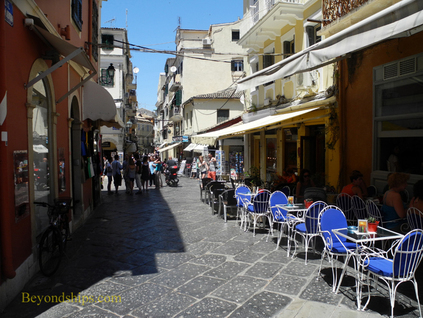 But elsewhere Corfu can be spectacularly eye-pleasing. It receives more rainfall than some of its neighbors and so the countryside is often rich with vegetation - - poplars, fig trees, lemon trees and in the Spring and early Summer, thick wreaths of bougainvillaea. Surrounding the island is the Ionian Sea, which can be as still as a lake on a summer day with the mountains of Albania and the Greek mainland off in the distance. Of course, Corfu has its own mountains from which you can take in the panorama. Not all of the beauty is the product of nature. While almost all of the structures in nearby Cephalonia were toppled by the 1953 earthquake, much of the building from Corfu's past remains standing. 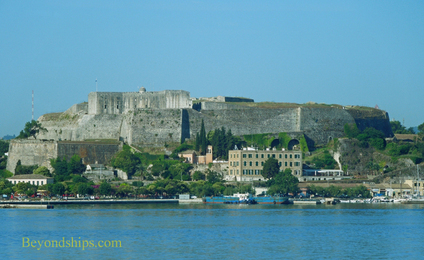 On one side of Corfu Town is the Old Fort, which was built on the site of the 6th century settlement. On the other side of town, is the New Fort, begun by the Venetians in the 16th century. Standing below its towering walls, it indeed looks impregnable. Between the two fortresses is the old portion of town. A UNESCO World Heritage site, it is marked by narrow winding streets and Venetian-style architecture. It is busy and many shops cater to the tourist trade with signs written in English. The merchandise ranges from souvenirs to upscale offerings. There are also outdoor cafes and taverns. 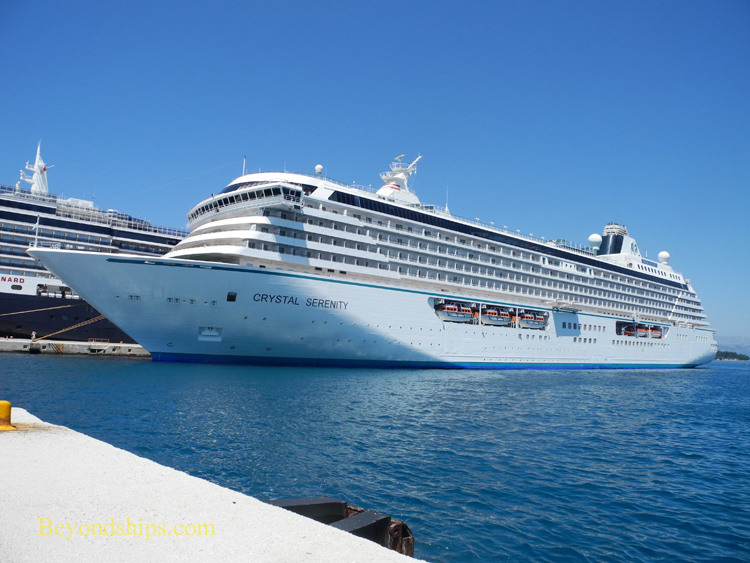 Above: Crystal Serenity at the cruise ship pier in Corfu. The pier is on the outskirts of Corfu Town. It is a long walk along a busy road to get to the old section of the town. Many ships provide a shuttle bus into town.